For other people named Alex Ross, see Alex Ross (disambiguation). Alex Ross was born in Portland, Oregon, and raised in Lubbock, Texas, by his minister father, Clark, and his mother, Lynette, a commercial artist from whom he would learn many of the trademarks of his artistic style. Ross first began drawing at age three, and was first influenced by superheroes when he discovered Spider-Man on an episode of the children's TV series The Electric Company. He would later be influenced by comics artists such as John Romita Sr., Neal Adams, George Pérez and Bernie Wrightson, and attempted to imitate Pérez' style when he did superhero work, and Wrightson's when he did what he calls "serious" work. By age 16, Ross discovered the realistic work of illustrators such as Andrew Loomis and Norman Rockwell, and envisioned one day seeing such styles applied to comic book art. At age 17, Ross began studying painting at the American Academy of Art in Chicago, where his mother had studied. During his years there, Ross discovered the work of other artists like J. C. Leyendecker and Salvador Dalí, whose "hyper-realistic quality", Ross saw, was not that far removed from that of comics. It was during this time that he formed the idea to paint his own comic books. Ross graduated after three years. After graduating, Ross took a job at an advertising agency as a storyboard artist. Ross' first published comic book work was the 1990 five-issue miniseries, Terminator: The Burning Earth, written by Ron Fortier and published by NOW Comics. Ross created all of the art, from pencils through coloring for the series. He performed similar work on a variety of titles over the next few years. His first work for Marvel Comics was to have been printed in the science-fiction anthology series Open Space #5 but the title was cancelled with issue #4 (August 1990). Ross' story was printed in 1999 as a special supplement to Wizard's Alex Ross Special. In 1993, he completed his first painted superhero assignment, the cover of a Superman novel, Superman: Doomsday & Beyond. Ross' rendition of the Justice League. During this time, Ross met writer Kurt Busiek, and the two began submitting proposals for series that would feature paintings as their internal art. Marvel agreed to a project that would tell much of the history of the Marvel Universe from the perspective of an ordinary person. That limited series, Marvels, was released in 1994, and chronicled the life of a photojournalist, as he reacted to living in a world of superheroes and villains. Busiek, Ross, and penciller Brent Anderson created Astro City, first published by Image Comics in 1995 and later by WildStorm Comics. The series features an original superhero world and continues the theme of Marvels, exploring how ordinary people, superheroes and villains react to a world where the fantastic is commonplace. Ross paints the covers and helps set the costumes and the general look and feel for the series, which has been published sporadically in recent years. In 1996, Ross worked with writer Mark Waid on the DC Comics limited series Kingdom Come, which presents a possible future for the DC Universe, in which Superman and several other classic superheroes return from retirement to tame a generation of brutal anti-heroes. The work featured Ross' redesigned versions of many DC characters, as well as a new generation of characters. Ross co-created the original character Magog, patterning his appearance and costume on Cable and Shatterstar, two characters created by Rob Liefeld. DC Comics writer and executive Paul Levitz observed that "Waid's deep knowledge of the heroes' pasts served them well, and Ross' unique painted art style made a powerful statement about the reality of the world they built." Ross followed Kingdom Come with Uncle Sam, a non-superhero work for DC's Vertigo line, an experimental work that examined the dark side of American history. Ross drew the lenticular covers for Superman: Forever #1 (June 1998) and Batman: No Man's Land #1 (March 1999). Between 1998 and 2003, writer Paul Dini and Ross produced annual tabloid-sized editions celebrating the 60th anniversaries of DC Comics' Superman (Peace on Earth), Batman (War on Crime), Shazam (Power of Hope), and Wonder Woman (Spirit of Truth), as well as two specials featuring the Justice League, Secret Origins and Liberty and Justice. In the early 2000s, with writer Jim Krueger, Ross plotted and designed characters for a trilogy of Marvel limited series, Earth X, Universe X, and Paradise X, which combined dozens of Marvel characters from various time periods. When M. Night Shyamalan's film, Unbreakable was released to video in 2001, the DVD included an insert with Ross' original art, as well as a commentary by Ross, regarding superheroes, in the movie's special features. In 2001, Ross won acclaim for his work on special comic books benefiting the families of those killed in the September 11, 2001 attacks, including his portraits of paramedics, police and firefighters. He has designed DC merchandise, including posters, dinner plates, and statues. In late 2001, Ross painted four covers to the December 8, 2001 TV Guide, which depicted Tom Welling, Kristin Kreuk and Michael Rosenbaum of the TV series Smallville, and Superman. Ross designed a series of costumes for the 2002 film Spider-Man, though they were not used in the film. In the film's video game tie-in, as an Easter egg, it is possible to unlock a playable version of Ross' Spider-Man design. When using this, the Green Goblin will feature one of Ross' unused character outfits. Ross' design was featured as an unlockable costume and available in a white version in the PlayStation game Spider-Man 2: Enter Electro. 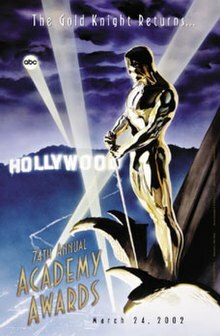 In early 2002, Ross designed the promotional poster for the 2002 Academy Awards, which depicted Oscar perched atop the First National Building. The Academy loaned Ross an actual Oscar statuette for a week for him to use as reference for the painting. Ross stated that he photographed members of his family as if they were receiving it. That same year, he was one of four artists who depicted Spider-Man on one of the covers to the April 27, 2002 issue of TV Guide as a promotional tie-in to the feature film Spider-Man. Ross' poster for the 74th Academy Awards. Ross illustrated the cover art on the Anthrax albums We've Come for You All (2003), Music of Mass Destruction (2004), Worship Music (2011), and For All Kings (2016). In 2003, Pantheon Books published the coffee table book Mythology: The DC Comics Art of Alex Ross, written and designed by Chip Kidd, and featuring a foreword written by M. Night Shyamalan. In late 2005, a paperback version of the book was published to include new artwork by Ross, including sketches for his Justice mini-series. Also in 2004, Ross designed 15 paintings for the opening credits of the film Spider-Man 2. The paintings presented key elements from the first film. Ross later donated the paintings to be auctioned off on eBay to benefit the United Cancer Front. In 2005, Ross designed the DVD illustration covers for the re-release of Gatchaman by ADV Films. He appeared in a featurette discussing his involvement of Gatchaman in his career. In August 2005, Ross worked again with writer Jim Krueger and penciller Doug Braithwaite on 12-issue, bi-monthly limited series Justice for DC Comics. The series focuses on the enemies of the Justice League of America banding together to in an effort to defeat them. The cover of the "Savior of the Universe Edition" DVD of the 1980 film Flash Gordon, released on August 7, 2007, features a cover painted by Ross. An avid fan of the film, he starred in a featurette on the DVD where he discussed the movie, which he names as his favorite movie of all time. In 2008, Ross embarked on projects focusing on Golden Age characters: Project Superpowers with Jim Krueger for Dynamite Entertainment. That same year, Ross wrote and illustrated Avengers/Invaders. It features Marvel characters but was published by Dynamite Entertainment. The story pits World War II versions of Captain America, Namor, and other classic war characters against the modern Avengers groups. Late 2008 saw the release of two Ross prints that were made into T-shirts: one, "Bush Sucking Democracy Dry", featuring George W. Bush as a vampire sucking the blood from Lady Liberty, and the other, "Time for a Change", featuring Barack Obama as a superhero. The latter was made into a T-shirt, with which Obama was seen posing at a public event. Ross painted the "Kollectors Edition" cover for the console game Mortal Kombat vs. DC Universe. The artwork was released on October 9, 2008, as was a video chronicling Ross' process of painting it. Ross is featured in his own segment on the Blu-ray/DVD included in the package. Dynamite Entertainment announced that Ross would illustrate covers for the Fighting American series. Other Ross projects for Dynamite include acting as the creative director on The Phantom comic book series. and teaming with Kurt Busiek on Kirby: Genesis, an eight-issue miniseries which debuted in 2011. The series was their first full collaboration since Marvels 17 years previous, and features a large group of Jack Kirby's creator-owned characters, the rights to which were acquired by Dynamite, such as Silver Star, Captain Victory, Galaxy Green, Tiger 21 and the Ninth Men. Ross handled the series' co-plotting, designs, and covers, apart from overseeing the book overall with Busiek, who was the writer. Since 2011, Ross has been painting covers for several Dynamite titles such as The Green Hornet, Silver Star, Captain Victory, The Bionic Man, Lord of the Jungle, The Spider, among others. In 2012 Ross drew promotional artwork of Ratonhnhaké:ton, the main character of the video game Assassin's Creed III, used on the cover of the April 2012 issue of Game Informer and the collectible steelbook case provided with certain editions of the game. that same year, Ross returned to interior painted art with Masks, a story in which the Shadow, the Spider, the Green Hornet, Zorro and others join forces to combat a mutual threat. In 2013 Ross created an exclusive GameStop pre-order poster for the video game Watch Dogs, which was scheduled for debut November 19 of that year, but has since been delayed to 2014. The game is set in Ross' home of Chicago, which Ross emphasized in the image by placing the Willis Tower and the elevated train tracks in the background. With Marvel's "All-New, All-Different Marvel" relaunch, Ross did a variety of covers for the main comics in the relaunch such as the cover for The Amazing Spider-Man and Squadron Supreme. In 2015, following the conclusion of that year's "Secret Wars" storyline, Ross designed the high-tech variation of Spider-Man's costume that the character wore during Dan Slott and Giuseppe Camuncoli's run on The Amazing-Spider-Man. DC Direct, the collectibles division of DC Comics, has produced three sets of action figures from the comic book Kingdom Come based on Alex Ross' artwork. The first set of figures included Superman, Wonder Woman, Green Lantern, and Hawkman. The second set included Batman, Red Robin, Captain Marvel, and Kid Flash. The last set included Magog, Flash, Armored Wonder Woman, and Deadman. An exclusive figure of Red Arrow was released through ToyFare magazine. DC Direct also released several other Ross-designed characters through their Elseworlds toylines. These figures included the Spectre, Norman McCay, Jade, Nightstar, Aquaman, and Blue Beetle. Ross designed the costume the current incarnation of Batwoman wears; this character has been released in action-figure form by DC Direct as part of its "52" line of toys. Series 5: Brainiac, Green Arrow, Lex Luthor, Martian Manhunter, Martian Manhunter (Translucent), Red Tornado. Series 6: Batman Armored, Green Lantern Armored, Hawkgirl, Scarecrow. In 2019, Hasbro released several figures based on Alex Ross' art as part of the Marvel Legends line. The toys were released to celebrate the 80th anniversary of Marvel Comics, and included Ross-designed versions of Iron Man, Thor and Captain America. 1998 National Cartoonists Society Comic Book "Reuben" Award for Superman: Peace on Earth. Ross won the Comics Buyer's Guide's CBG Fan Award for Favorite Painter seven years in a row, resulting in that publication's retirement of that category. Comics Buyer's Guide Senior Editor Maggie Thompson commented in regard to this in 2010, "Ross may simply be the field's Favorite Painter, period. That's despite the fact that many outstanding painters are at work in today's comic books." ^ "Alex Ross". Lambiek Comiclopedia. 2012. Archived from the original on May 7, 2012. ^ a b "Reinventing the pencil: 21 artists who changed mainstream comics (for better or worse)". The A.V. Club. July 20, 2009. Archived from the original on November 27, 2009. Retrieved November 25, 2009. ^ Devlin, Desmond (May 2010). "Graphic Novel Review: Garfield: His Most Over-Rendered Book". Mad (503): 10. ^ a b Thompson, Maggie. "Super-power to the people!" Comics Buyer's Guide. #1663 (March 2010), Page 16. ^ a b c d e f g "Alex Ross Biography". AlexRossArt.com. n.d. Archived from the original on December 3, 2013. ^ "Once Upon A Time The Super Heroes". YouTube. December 6, 2007. Retrieved February 12, 2012. ^ Khoury, George (February 2000). "Alex Ross Interview". The Jack Kirby Collector. TwoMorrows Publishing (27). Archived from the original on December 6, 2013. I was personally influenced by what John Romita or Neal Adams brought to art. ^ a b c d "The Creators," Avengers/Invaders Sketchbook (Marvel Comics, 2008). ^ Weiland, Jonah (May 10, 2006). "Ten Years Later: Reflecting on "Kingdom Come" with Alex Ross". Comic Book Resources. Archived from the original on April 21, 2009. ^ Levitz, Paul (2010). "The Dark Age 1984–1998". 75 Years of DC Comics The Art of Modern Mythmaking. Cologne, Germany: Taschen. p. 574. ISBN 9783836519816. ^ Smith, Zack (December 2012). "Paul Dini & Alex Ross Discuss a Treasured Format". Back Issue!. TwoMorrows Publishing (61): 69–77. From 1998 to 2003, [Paul Dini and Alex Ross] produced a series of fully painted oversized books featuring DC's biggest heroes. ^ Manning "1990s" in Dolan, p. 286: "Alex Ross teamed up with writer Paul Dini...to tell a powerful story of the Man of Steel. In this beautiful sixty-four-page oversized one-shot...Superman fought a battle even he couldn't truly win: the war on poverty and hunger." ^ Manning "1990s" in Dolan, p. 289: "The second in the oversized prestige-format tabloid collaborations between writer Paul Dini and painter Alex Ross, Batman: War on Crime was just as successful as its predecessor, and just as beautiful." ^ Manning "1990s" in Gilbert (2008), p. 296: "Jim Krueger and Alex Ross...kicked off their epic fourteen-part Earth X saga with a special #0 issue in March 1999." ^ a b c d Gaudiosi, John (May 1, 2013). "Alex Ross Talks Watch_Dogs Poster, Digital Comics And Video Games As Art". Forbes. Archived from the original on October 29, 2013. ^ "Spider-Man – Movie Concepts Gallery". AlexRossArt.com. n.d. Archived from the original on 2013-10-29. Retrieved February 21, 2013. ^ P., Ken (October 22, 2003). "An Interview with Alex Ross". IGN. Archived from the original on February 1, 2014. ^ Mason, Chris (July 1, 2004). "Exclusive – Alex Ross Spider-Man 2 Art". Superhero Hype. Archived from the original on February 2, 2014. ^ a b "Opening Title Paintings From Spider-Man® 2 To Be Offered in Charity Auction on eBay Starting September 22". AlexRossArt.com. 2004. Archived from the original on 2013-12-06. Retrieved February 21, 2013. ^ "ADV Brings Gatchaman to America". Anime News Network. March 26, 2005. Archived from the original on November 4, 2008. Retrieved May 26, 2013. ^ Orndorf, Brian (August 7, 2007). "Flash Gordon – Saviour of the Universe Edition". DVD Talk. Archived from the original on February 18, 2013. ^ "Ross! Krueger! Dynamite! Superpowers!". Comic Book Resources. July 18, 2007. Archived from the original on May 17, 2011. ^ George, Richard (August 11, 2007). "Interview: Alex Ross Returns to Marvel". IGN. Archived from the original on February 2, 2014. ^ Weiland, Jonah (August 14, 2007). "Ross' Return = Avengers/Invaders". Comic Book Resources. Archived from the original on May 2, 2008. ^ Brady, Matt (August 14, 2007). "Alex Ross Talks Avengers/Invaders". Newsarama. Archived from the original on September 6, 2007. ^ Saburi Ayubu, Kani (December 31, 2008). "Barack Obama: "Here I Come To Save The Day"". The Black Art Depot Today. Archived from the original on November 27, 2013. ^ "Obama Sports Alex Ross T-Shirt". AlexRossArt.com. October 31, 2008. Archived from the original on 2013-12-06. Retrieved 2012-05-21. ^ "Alex Ross Packaging Art for Mortal Kombat Vs. DC Universe". Comic Book Resources. October 9, 2008. Archived from the original on October 13, 2008. ^ Phegley, Kiel (July 24, 2009). "CCI: Fighting American Comes to Dynamite". Comic Book Resources. Archived from the original on August 28, 2009. ^ "Alex Ross & Dynamite Bring in The Phantom". Newsarama. May 7, 2010. Archived from the original on January 11, 2014. ^ "Alex Ross & Kurt Busiek Team For Dynamite's Kirby: Genesis". Newsarama. July 12, 2010. Archived from the original on January 11, 2014. ^ Miller, Matt (March 1, 2012). "April Cover Revealed: Assassin's Creed III". Game Informer. Archived from the original on November 1, 2013. ^ Orry, Tom (March 26, 2012). "Assassin's Creed 3 Collector's Editions revealed". VideoGamer.com. Archived from the original on October 29, 2013. ^ Arrant, Chris (August 31, 2012). "Alex Ross Returns to Interior Painted Art in Masks". Newsarama. Archived from the original on October 29, 2013. ^ Lu, Alexander (June 30, 2015). "Check out the All-New, All-Different Amazing Spider-Man Costume". The Beat. Retrieved December 22, 2018. ^ Dietsch, T.J. (February 19, 2019). "Toy Fair 2019: See Tons of New Marvel Legends Figures". Marvel Entertainment. Retrieved February 26, 2019. ^ "Comics Buyers Guide Fan Awards". Comic Book Awards Almanac. n.d. Archived from the original on September 25, 2013. Retrieved February 1, 2014. Kidd, Chip; Spear, Geoff (2003). Mythology: The DC Comics Art of Alex Ross. New York: Pantheon Books. ISBN 978-0375422409. OCLC 928367310. Kidd, Chip; Spear, Geoff (October 2, 2018). Marvelocity: The Marvel Comics Art of Alex Ross. New York: Pantheon Books. ISBN 9781101871973. Alex Ross Images. Comic Book Images Gallery.